It’s amazing how a dish so beautiful can actually be so simple. I’ve been on and off the paleo wagon for over a year. I love carbs so much, it’s impossible for me to abandon them completely, but I didn’t miss them in this recipe at all. Don’t think you have time to create a picture-perfect breakfast yourself? Try this recipe. You’ll love it. For the hollandaise, whisk egg yolks and lemon juice in a bowl over a pan of barely simmering water (do not let bottom of bowl touch water). Slowly drizzle in melted butter and keep whisking until mixture thickens. Do not overcook. Remove from heat and whisk in salt and cayenne pepper. Cover and set aside while preparing eggplant and eggs. Heat oil olive in a skillet over medium-high heat. Add lamb sausage and cook until browned. For the eggplant, brush each slice with butter and sprinkle with salt and pepper, place in broiler and brown. To poach the eggs, fill a large pot about half full with water and add vinegar. Bring to a boil,. Crack eggs into a small bowl and gently pour them into the water. Remove from heat, cover and let sit for 4 minutes. Remove with a slotted spoon to let water drain off. 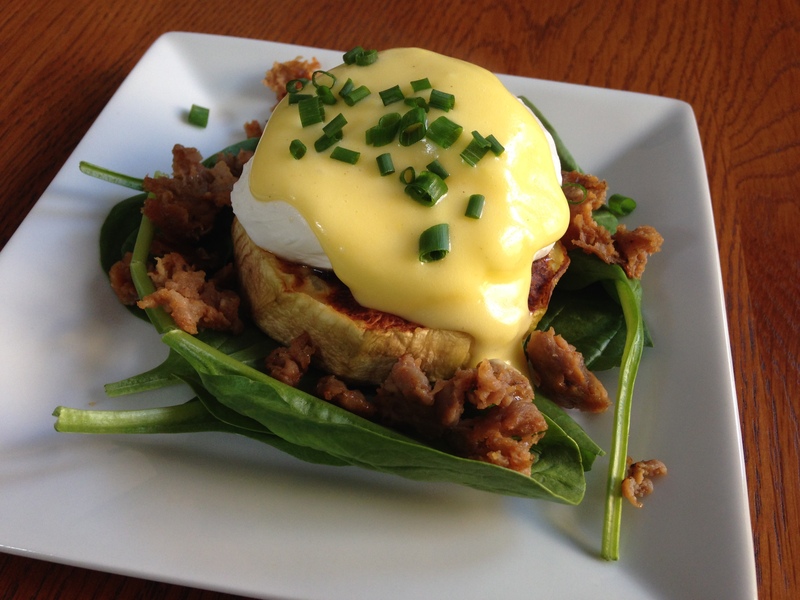 To assemble, place fresh spinach on plates, top with eggplant, lamb sausage, egg, hollandaise sauce and green onions.